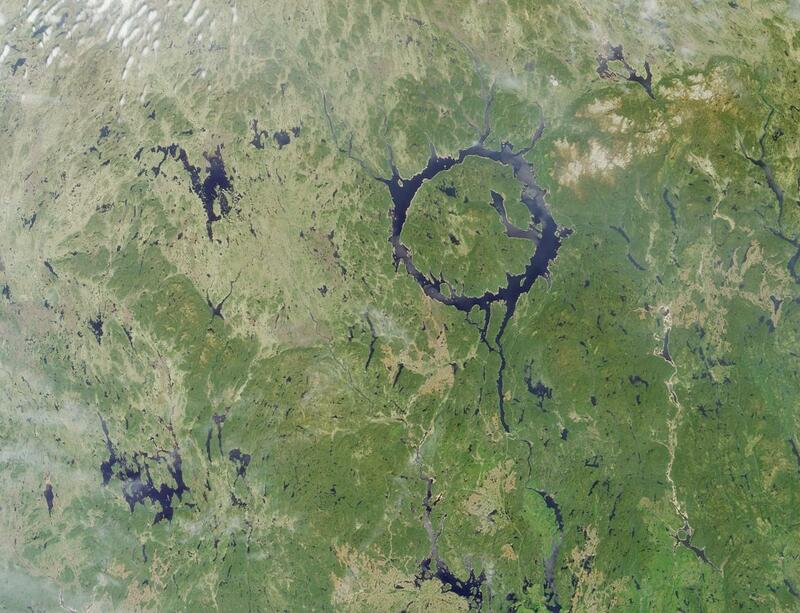 The large annular lake in this image represents the remnants of one of the largest impact craters still preserved on the surface of the Earth. Lake Manicouagan in northern Quebec, Canada, surrounds the central uplift of the impact structure, which is about 70 kilometers in diameter and is composed of impact-brecciated rock. Glaciation and other erosional processes have reduced the extent of the crater, with the original diameter estimated at about 100 kilometers. This natural-color image of the region was acquired by MISR's nadir (vertical-viewing) camera on June 1, 2001, during Terra orbit 7737. The impact that formed Manicouagan is thought to have occurred about 212 million years ago, toward the end of the Triassic period. Some scientists believe that this impact may have been responsible for a mass extinction associated with the loss of roughly 60% of all species. 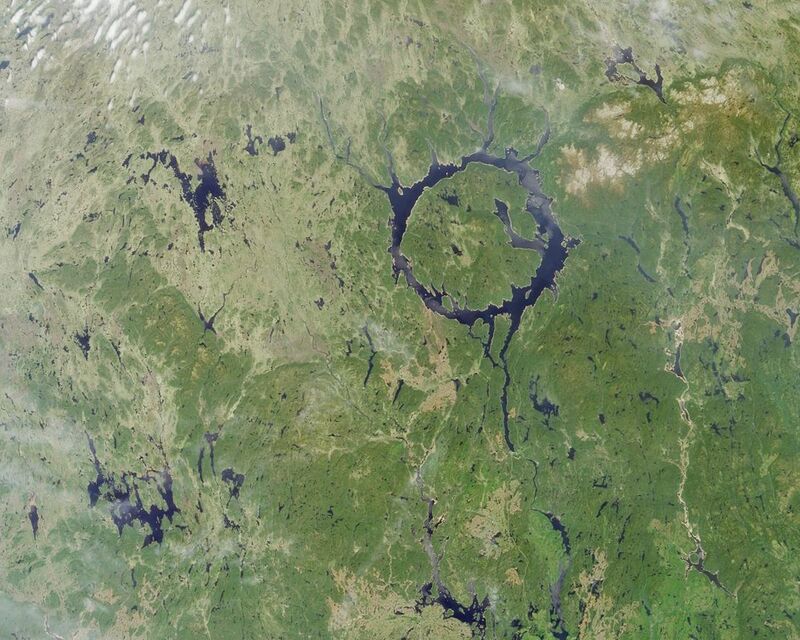 It has been proposed that the impact was created by an asteroid with a diameter of about 5 kilometers. The lake is bounded by erosion-resistant metamorphic and igneous rocks, and shock metamorphic effects are abundant in the target rocks of the crater floor. 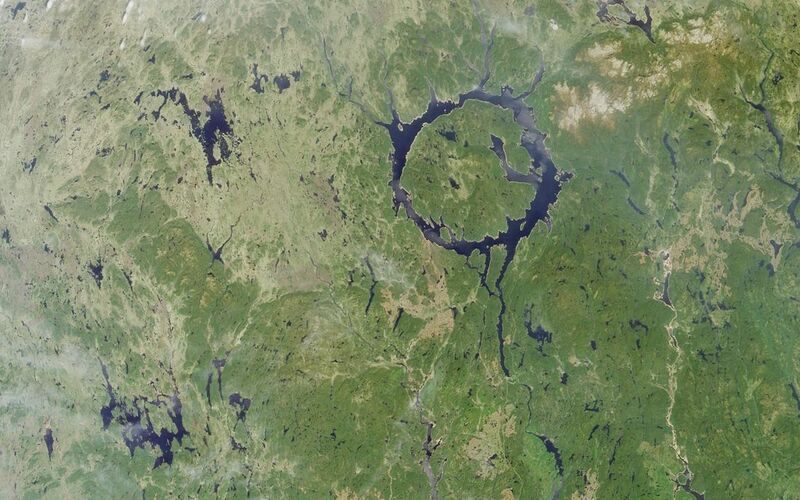 Today Lake Manicouagan serves as a reservoir and is one of Quebec's most important regions for Atlantic salmon fishing.